Do you think Ulmo foresaw his treachery, and it was him that Ulmo/Tuor were warning Turgon against? Many years ago, I (not seriously) proposed making a Fall of Gondolin musical. Maeglin's first solo would have been entitled "A Girl Who's Not My Mother". Oh look! A girl who's not my mother! Amazing! Awesome! I had no idea such a thing existed! What's this? A girl who's not my mother! This girl -- is not -- my motherrrrr! I think it'd be a big hit. I think I agree with your thought, though - it's the sort of thing that happens all the time even today. "She smiled at me - she must want to date me!" Interesting! So, did Tolkien consciously decide that the only Men capable of killing one of the Elder Children were his three great heroes (counting Beren here, because... well, he could have)? Or is it just the fact that they're the only Men who had opportunity to fight Elves while also being the focus of a story? ... huh. Come to think of it, Dior was born to two mortal parents. When that happened to Elros' kids, they were just mortal by default. The evidence suggests, then, that the second King of Doriath may well have been a mortal Man, and his children only regained their immortal legacy through Nimloth their mother. So we can potentially add him to the list and make four. Re: Your question: Honestly, I think that only Turin and Tuor should count as having accomplished such a feat. It's possible, but I've never got the impression the Valar could foresee the actions of specific people. Ulmo seems to have been responding more to the Doom of Mandos, and the fact that everything the Noldor built was prophesied to fall. "Love not too well the work of thy hands and the devices of thy heart; and remember that the true hope of the Noldor lieth in the West, and cometh from the Sea." Well, Beren is specifically said to have been in the middle of killing Curufin when Luthien told him to stop... and why exclude Dior? It's just an opinion I have on things. You're welcome to have a different one, of course. I should certainly hope so! I was just wondering if you had any thoughts on the question of whether Dior was mortal. 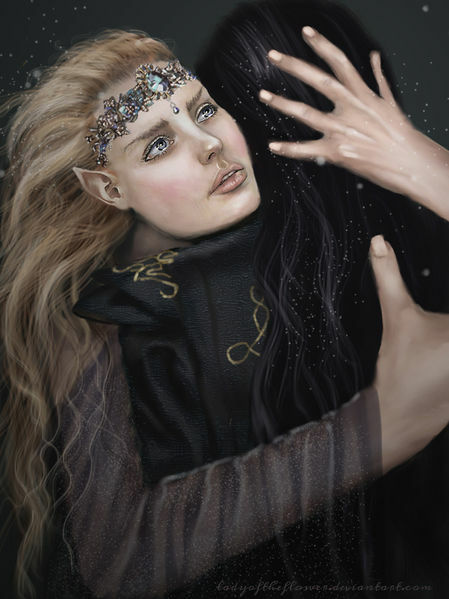 Do you think that Morgoth intended for Maeglin to die? He made sure Maeglin was safe from his own forces, but he gave him no safety from the people of Gondolin. Meaning he might have anticipated that Maeglin would die either way, at the hands of his own allies no less. Of course, the question is: what did he hope to accomplish by having his own loyalist killed? Dior is not one of the topics which interests me, so I never dug deeper on that. On the basis of no evidence at all, I'm going to say yes, he fully intended for Maeglin to die. I tend to view Morgoth as the ultimate nihilist - he'll promise anything he cares to, but feels no obligation to keep those promises. Sauron does this too, promising Gorlim his life back to betray Barahir and then offing him anyway. Did he keep Maeglin safe from his forces? Maeglin was safe, but he never left the city, and I don't remember him running into any Orcs or Balrogs in the FoG. It's entirely possible that if he'd encountered Gothmog, he would have been skewered even while declaring his loyalty to the Iron Crown. Like I say, this isn't an evidenced position, and I'm more than willing to shift it if you know of source text I've not considered. There isn't evidence per se. Presumably, he gave Maeglin a token he was to show should he encounter any of Morgoth's troops, and they'd leave him alone in turn. But this is just a fan theory I stumbled across. People on another forum say that Maeglin was an agent of Morgoth, who harbored fear and hatred for all Eldar, Maeglin included. If we suppose this to be the case, then the question 'what did he hope to accomplish with that'? Also, you never answered my earlier question: Could Morgoth have counter-summoned Maeglin's spirit to do his bidding? Last edited by Urwen; 04-14-2019 at 10:53 AM. You ask what Morgoth wanted to accomplish. In a word: discord. Before he was Fire and Ice and Darkness, Melkor was the Power of the sour note, the discordant strain, the chord at odds with the melody. If Sauron or Saruman had a defector in their pocket, they'd want to get as much out of them as they can - Morgoth is happy just to use them once to make a mess of things. Think of how he treats the Easterlings - they stab House Feanor in the back for him, but he cheerfully lets their leaders get slaughtered, then pins what's left of them up in Hithlum. Morgoth has no concept of loyalty to others; Maeglin was just another tool. Worth sending back in case he could get the defenses down, but not something worth keeping around once Gondolin was gone. Good question! I have no idea. The idea of Morgoth being able to ensnare Elven spirits is common enough that it must have some source, but I don't know what it is. So... what use would the Dark Lord get out of the shade of an elf that nobody left alive trusted? You'd have to look into whether possession is a thing in Middle-earth; again, it's a common idea, but what the source is, I couldn't say. (Did you mean '... he was mortal'?) It depends what we're really looking for. 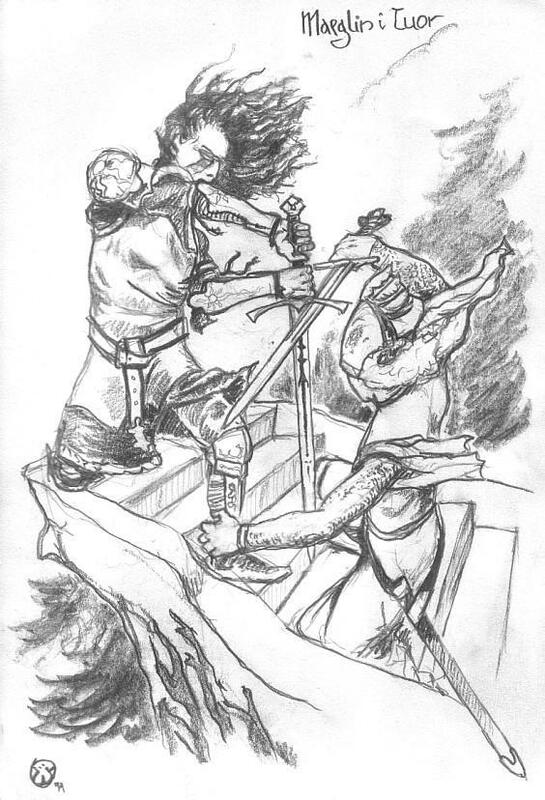 Like Turin, Tuor, and presumably Dior, Beren overcame an elf in single combat and had the ability to kill him - but he didn't actually do so. So... what use would the Dark Lord get out of the shade of an elf that nobody left alive trusted? Maybe he merely wanted to torture him, as you said earlier. The 'Fall of Gondolin' book has come out. It'd be a more detailed description on FoG, which means it'll also feature you-know-who more extensively. Can't wait for it to be translated and distributed within my country so I could get my hands on it for more Maeglin goodness. What would be a good title for Maeglin-centric fan story? Not sure who it's supposed to be. Depends on the story, I guess. Can you give us any details? Well, there are no stories that depict his complete life, or his time in Halls of Mandos, so I figured I might write both of those. Because, in case you didn't figure it out from my ramblings, I pity him. Sadly, the Fall of Gondolin book is pretty much just a collection of the versions found in HoME and UT. It's a beautiful book, but I don't think there's much new in there (though if you don't happen to own the entirety of HoME, I guess there is!). I don't own HoME, no. And yes, I suppose it is, although I was honest about using this thread for random/silly questions. And yes, I went with 'Child of Twilight' for title. Thank you. If you want the link to the story, just say so and I'll PM it to you. Do you think Maeglin was afraid of Caragdur/Amon Gwareth early on? I think that Maeglin was probably afraid of a lot of things. Born in the dark woods, Maeglin was forbidden by his father from seeing the sun. He visited only the mines of the dwarves; his entire childhood was closed-in, by trees or walls. The ride across Beleriand must have shaken him deeply: he was in a world entirely beyond his experience. Then Gondolin, high rather than deep, full of light - nowhere to hide, everyone insisting he dance and sing, nowhere to just sit and be still. It's no wonder he takes to mining as a way to get a proper roof over his head, and a bit of peace from... everyone. And then his father, who has controlled his life, shows up, and kills his mother, and is killed in turn by his uncle. Already worried by heights, yes, I can see that developing into a full-blown phobia for a while. It would also tarnish his uncle in his eyes somewhat, leaving Idril as his only 'pure' family member. It's not unreasonable to cast him as the youngest person in the city: elves tend not to have kids in time of war, and Turgon is smart enough to have recognised Glaurung's outing in 260 as a serious omen. Maeglin was born in 320, and arrived in the city in 400. So he's the kid (as he has always been, to both his parents), but also, to everyone else, the weird prince. Once again, Idril - barefoot, visionary - is weird enough to be the only person he can possibly relate to. And yeah - that connection and idolising turns to love, and twists with each rejection. Tuor? Tuor shows up looking like his replacement, or his bright mirror. Beloved of Idril, prince of Gondolin, leader of a new House - but while Maeglin has trouble talking to people, Tuor finds it easy, effortless. It's hard NOT to hate him. And then Earendil. If Maeglin is the youngest of Gondolin, Earendil is his final ousting: a new prince, beloved of Turgon, almost certain to steal his position as heir. Sure, it's not the kid's fault- but his upbringing wasn't Maeglin's fault, and look how little people make allowances for THAT. ... or something like that. Maeglin is a misfit, a child of twilight thrust into a world of light that never understood him. I am glad other people think these things. I think it was Maedhros who had me wondering if you could starve an elf to death. Thank you!!! So it's not just me. Maeglin was 190 yesrs old before he was killed, so not the youngest in Gondolin. Youngest among other Elda, but Tuor was also younger than him. Last edited by Urwen; 04-15-2019 at 02:39 AM. Yeah, I meant prior to that. Tuor's arrival, and even more so Earendil's birth, would have disrupted and overturned what I see as a key part of his self-image: that he was the youngest, and that (in the age-old refrain) "nobody understands me!". When Tuor arrives, Maeglin finds out that being youngest doesn't necessarily mean you have to be disliked. He needs to either take that as a lesson and grow - or reject it and come to hate Tuor. We all know which way he went on that score. Then Meglin was bidden fare home lest at his absence men suspect somewhat; but Melko wove about him the spell of bottomless dread, and he had thereafter neither joy nor quiet in his heart. Nonetheless he wore a fair mask of good liking and gaiety, so that men said: "Meglin is softened", and he was held in less disfavour; yet Idril feared him the more. Now Meglin said: "I have laboured much and am minded to rest, and to join in the dance and the song and the merrymakings of the folk", and he went no more quarrying stone or ore in the hills: yet in sooth he sought herein to drown his fear and disquiet. Adread possessed him that Melko was ever at hand, and this came of the spell; and he durst never again wander amid the mines lest he again fall in with the Orcs and be bidden once more to the terrors of the halls of darkness. Twice we're told he no longer knows quiet, and that he used to 'wander amid the mines'; coupled with the Silm statement that "His words were few save in matters that touched him near", I take that as confirmation that he didn't want to be among people. What Morgoth did to him was actually crueller than physical torture: he took away his ability to enjoy the silence. Maeglin literally had to drown out what he'd once found restful, because the Dark Lord had poisoned it against him. In one way, this is fitting punishment: this is after he'd basically stalked Idril, after he'd betrayed his city for promise of power. But in another, it's unbearably pitiable. I agree with you that he was a child, and remained such until the end. Which only makes his end even more tragic. Could I have your thoughts regarding this too? Then the Unlight of Ungoliant rose up even to the roots of the Trees, and Melkor sprang upon the mound; and with his black spear he smote each Tree to its core, wounded them deep, and their sap poured forth as it were their blood, and was spilled upon the ground. How much force do you need to stab a tree to its heart? To ballpark this, I'm going to assume that the Two Trees were the size of the largest giant redwood, so ~30ft in diameter. That means Morgoth's spear has to punch 15 feet. Using this list, we find that a modern arrow imparts ~60 foot-pounds of at impact - it could push 60 lb through one foot. The arrow will penetrate an inch into the tree, meaning we'd need to be able to push 720 lb through that foot to actually penetrate a foot. And Morgoth pushed his spear 15 times that far. That's right on 10,000 pounds. Morgoth's minimum known attack strength is like having [url="https://cars.lovetoknow.com/List_of_Car_Weights"]3 medium-sized cars[url] piled on top of you, with their full weight resting on you (so 12 cars, if you're just under one wheel). It's a large elephant stepping directly on you with all four feet. It's the force of a car at 10mph not just hitting you and sending you flying, but crushing you directly against a wall. And Fingolfin survived it. Arguably, he also lifted it, when he 'thrice arose again'. A super-strong human can apparently lift ~500 lb - Fingolfin operated at 20x that level. Even if we trim that down by arguing that he didn't necessarily push Morgoth straight back up, and that he was operating under extreme adrenaline conditions, we still have to assume something like 5x maximum human strength. Beren only took down Curufin by knocking his horse over on top of him. Turin grabbed a sword from someone who wanted desperately not to hurt him. Dior probably had elven strength. Tuor is the only known mortal who went up against an elf in a fair fight and won. Tuor is the only known mortal who went up against an elf in a fair fight and won. And then threw said elf over the wall. Last edited by Urwen; 04-15-2019 at 04:12 AM. I think you're pushing that a bit far. Maeglin saw himself as a child, but that's no excuse for high treason, abduction, and the attempted murder of a seven-year-old in front of his mother. It's possible to understand his mindset without buying into it. True. Maeglin attempted to kill a child too. However, I too see him as one. By Eldar reckoning, being 190 years old is pretty much an equivalent of a child. I think I should change the topic before it gets out of hand. What should the new topic be? There’s no evidence, to my recollection, that elves matured more slowly than men; they simply lived in their physical prime much longer. 190 year old elf might be young, but he has the accumulated knowledge and presumed wisdom of any 190 year old man. It's very Clockwork Orangy, don't you think? I agree it's a fitting punishment, as he cannot find satisfaction or make peace with what he's done, and it is very pitiable. Especially since he's pretty much done it to himself, misguidedly. A child in his own mind, and maybe a gloomy teen by behaviour, but certainly fully geown physically. And given his independence and bits of leadership, I expect he's not quite a child as that. Only in his own mind. The Eldar grew in bodily form slower than Men, but in mind more swiftly. They learned to speak before they were one year old; and in the same time they learned to walk and to dance, for their wills came soon to the mastery of their bodies. Nonetheless there was less difference between the two Kindreds, Elves and Men, in early youth; and a man who watched elf-children at play might well have believed that they were the children of Men, of some fair and happy people. For in their early days elf-children delighted still in the world about them, and the fire of their spirit had not consumed them, and the burden of memory was still light upon them. This same watcher might indeed have wondered at the small limbs and stature of these children, judging their age by their skill in words and grace in motion. For at the end of the third year mortal children began to outstrip the Elves, hastening on to a full stature while the Elves lingered in the first spring of childhood. Children of Men might reach their full height while Eldar of the same age were still in body like to mortals of no more than seven years. Not until the fiftieth year did the Eldar attain the stature and shape in which their lives would afterwards endure, and for some a hundred years would pass before they were full-grown. If you want to lean into the 'child' thing, you could have Maeglin be a late-bloomer, still 20 years shy of full growth when he reached Gondolin. But that's not evidenced in the text, and Silm: Of Maeglin actually implies the opposite. I don't know, I kinda like most people in their own way. Sometimes I like or dislike people in different chapters (*stares at some hobbits*). Easier to say who I like less. "(…) nette meant "girl approaching the adult" (in her "teens": the growth of Elvish children after birth was little if at all slower than that of the children of Men). The Common Eldarin stem (wen-ed) wendé "maiden" applied to all stages up to the fully adult (until marriage)." JRRT, from Vinyar Tengwar 47, texts generally dated 1967-70. "Thus (as the Eldar) they grew at much the same rate as other Men, but when they had achieved "full growth" then they aged, or "wore out", very much more slowly." JRRT Note 1, The Line of Elros, Unfinished Tales. Not every relevant citation, but the VT date is the latest I can did up so far. Last edited by Galin; 04-15-2019 at 09:00 AM.